Women in Nepal routinely suffer from lack of access to education, money, and other important resources. Millions of Nepali women are illiterate. They face systematic discrimination due to institutionalized chauvinism and a pronounced cultural preference for sons. The fundamental goal of ETC’s Women’s Empowerment program is to work directly and intensively with marginalized women, to help them gain the confidence and skills they need to make better lives for themselves and their families. Millions of Nepali women are illiterate. In a society where females are generally given more duties and less personal freedom and opportunities than their male peers, increasing the availability of education and literacy for women and girls of all ages is a vital step forward. When women are able to access and understand the written word, as well as perform basic math operations, a world of potential opens before them. While ETC’s Women’s Development Program encompasses the formation of women’s groups and cooperatives, the creation of savings and loan associations, and initiation of a host of social and economic development activities, literacy training remains a foundational activity. The Basic Literacy classes (beginning and advanced) last six months and are held for two hours per night, six nights per week. As they gain skills, the women are encouraged to express their views in Learner Generated Material workshops. They write stories, poems, and articles which ETC collects and publishes, and the publications are distributed to all women’s group members. Seeing their own written words formally presented provides them with a wonderful sense of accomplishment and validation, and increases their self-confidence. Celebration of events such as International Women’s Day and International Literacy Day also help motivate women and their communities to achieve the goals they set for themselves. ETC helps participants to formally organize into geographically based women’s groups – usually 15-25 women per group. These women’s groups are the basis of all other activities, including literacy classes and other training activities in topics related to agriculture and business skills. Women’s group members elect officers, hold monthly meetings, and pool their money to start their own microcredit funds, which they learn to manage and use to launch income-generating activities such as market gardening or livestock enterprises, small shops, etc. The women also benefit from peer support and a sense of solidarity. The effect of these programs on the lives of women and whole communities is profound. Through their newfound skills and income, women are able to fulfill many of the basic needs of the family. Access to credit allows them to start other productive activities and steadily increase their incomes. They also take more initiative to become active in their communities, whether through participation in school management committees (as individuals) or by undertaking and completing community improvement projects (in the context of their groups/cooperatives). Through their achievements, they not only build their own self-esteem, but also gain respect from the men in their lives, which places them at a more equitable level in Nepali society. 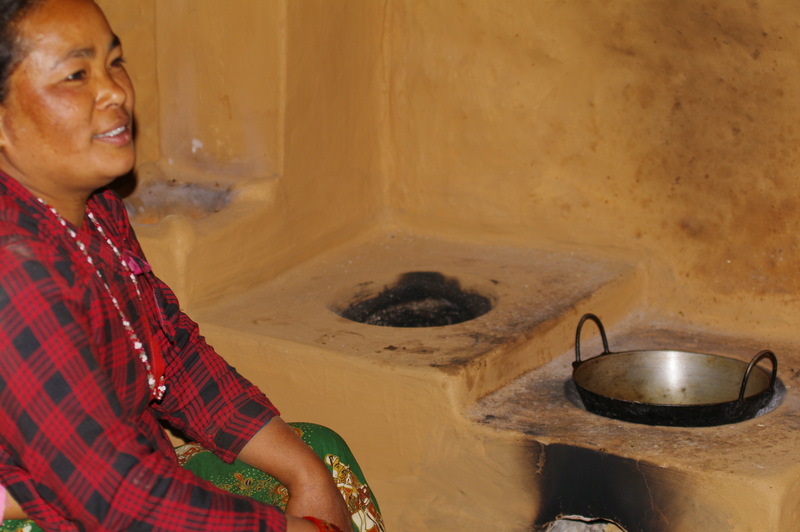 Rural women’s health needs are often given short shrift in Nepal. Nepali women spend countless hours working in the fields, carrying heavy loads, and cooking with wood fuel in poorly ventilated kitchens. Women often eat after the men in their families, and must sustain themselves with whatever food is remaining. Maternal and neonatal health is also hard to come by. ETC works to alleviate these problems by offering a variety of trainings and resources to help women’s group members improve the health and sanitation of their families, homes, and communities. Through ETC’s health trainings, women’s group members learn basic strategies for taking better care of themselves and their families – including boiling drinking water, frequent hand-washing, best practices in prenatal care, and encouragement to use the local health posts where available. Every women’s group member receives support for constructing a sanitary latrine, which greatly decreases the incidence of diseases that spread so readily when people must urinate and defecate in the open. ETC also enables many women to use alternative indoor cooking sources, such as the improved cooking stove pictured here, or biogas burners. Finally, our agricultural training activities enable all of our women’s group members to grow greater quantities of more nutritious food for themselves and their families.